We all know someone who complains that because they were the second, third or fourth child, there are no photos of them as a baby. To save future therapy bills, I created an album for each of my four children capturing their first year in great (and equal) detail. I made a particular effort to include photographs of them on their ‘birthday’ date each month – Sticky Bellies would have made the photo sorting job much easier. 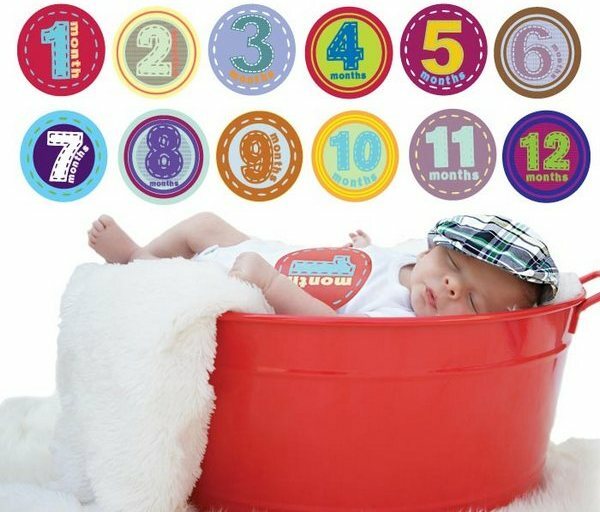 Sticky Bellies baby photo props are simple and sweet milestone stickers that are made to be stuck on your baby’s clothing for the all important photos commemorating their growth. Each pack includes twelve colourful stickers – your job will be to co-ordinate the wardrobe with the sticker each month! Sticky Bellies are US$14.99 and can be shipped internationally. If you have already missed all those first year photo opportunities check our previous post on BB Blocks or consider giving Sticky Bellies as a creative gift to new parents.